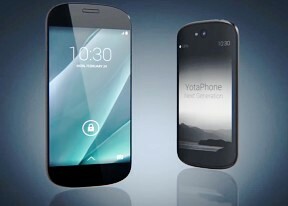 The YotaPhone 2 has a 5.0" AMOLED screen of 1080p resolution and 442ppi. There's Gorilla Glass 3 protection on top, to keep scratches away and provide extra impact resistance. AMOLED panels have the advantage to be slimmer, with more vibrant colors and far superior contrast compared to LCDs due to the naturally deep blacks. Under certain usage scenarios those screens even consume less power than regular LCD units though they cannot quite match the maximum brightness that LCDs offer. The display employs a Diamond PenTile matrix with RGBG subpixel arrangement. 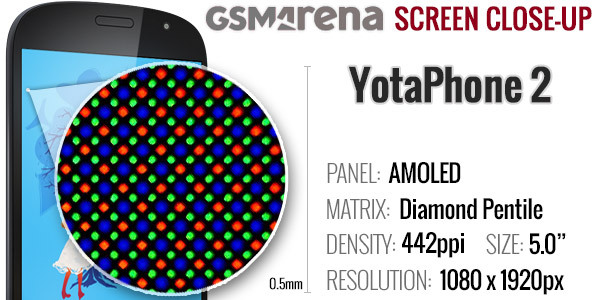 This delivers high perceivable sharpness compared to older gen AMOLEDs, which use the regular Pentile matrix. Obviously, AMOLED displays have inherently infinite contrast ratios, but we were able to measure the white brightness levels at 50% and 100% luminance. We found to be the panel notably less bright than the Samsung Galaxy S5 and Galaxy Alpha, but on par with the Lumia 930's screen. Since it's an AMOLED display, the stellar contrast should hardly surprise. The sunlight legibility is excellent, helped by the low reflectivity of the screen's surface, and it's pretty much on par with the Galaxy S5 and Galaxy Alpha. The rear electronic paper display is 4.7" in diagonal, with resolution of 540 x 960 pixels. It is also shielded by Corning Gorilla Glass 3, but this time around it's a curved glass. The glass isn't glossy, which is strange, instead it is matte for better handling and looks (no fingerprints here). Unfortunately, the matte display takes away some of the contrast and sharpness of the display making the text looks somewhat washed out. You will notice this only if you put the YotaPhone 2 next to another dedicated e-paper device such as a Kobo or a Kindle. Experienced e-paper readers will notice this for sure. Once you can setup the preferred text size, you can still enjoy hassle-free reading under bright sunlight. Your eyes won't get tired easily for sure. There is no backlighting under the e-paper display, so you can't use it when it's dark without some extra light. Finally, the rear display is a capacitive touchscreen, but if you have no experience with e-Ink screens, you will be amazed at the huge image refresh lag, which is typical for the technology. Despite these drawbacks we remain fans of the YotaPhone 2 rear screen. It offers unique functionality - not only for reading articles and books, but also it can make your phone look different every day thanks to the countless images or patterns you can use as always-on wallpapers, reading eBooks on it is great, and it can extend your battery life a lot. The YotaPhone 2 features a 2,500mAh battery, which according to Yota should be enough for 26 hours of 3G calls or 92 hours of music playback. We put those claims to test and we found those rather accurate. The YotaPhone 2 standby endurance isn't impressive at about 250 hours, but you can use the Yota Energy Saver to squeeze a lot more from your battery. We do our test without such enhancements though. 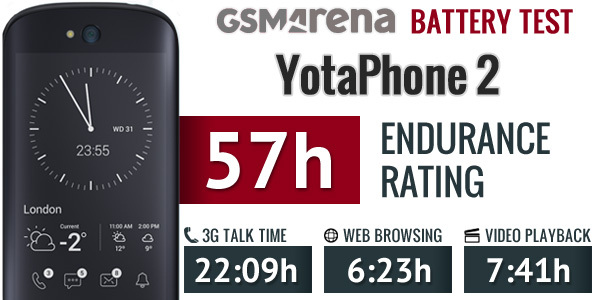 YotaPhone 2 indeed packed enough juice to support almost a day of 3G calls, but scored below average or average performance on the other tests, thus scoring an average final endurance rating of 57 hours. This means the YotaPhone 2 will last two days and then some if you do an hour of calls, an hour of video watching and an hour of web browsing each day. The YotaPhone 2 supports quad-band GSM and 3G networks with up to 42Mbps of download speed. It is also LTE-enabled with support for Cat.4 speeds (150Mbps download, 50Mbps upload). The rest of the connectivity features include dual-band Wi-Fi a/b/g/n/ac and Wi-Fi Direct. There is also support for Bluetooth 4.0, GPS and GLONASS, plus NFC. Stereo FM radio with RDS support is onboard, too. There is a microUSB 2.0 SlimPort for charging and data connections. Media transfer mode is supported for accessing the phone's built-in memory via a USB connection. The microUSB 2.0 port can also be used in USB On-the-go mode for connecting USB peripherals such as pen drives, keyboards or real USB hard drives.The SlimPort offers Quick Charge 2.0 and MHL 3.0. With the right adapter, you get 1080p@30fps output. The one thing we really miss is microSD card slot. You have 32GB internal storage. About 26GB of those are available for storage to the user.